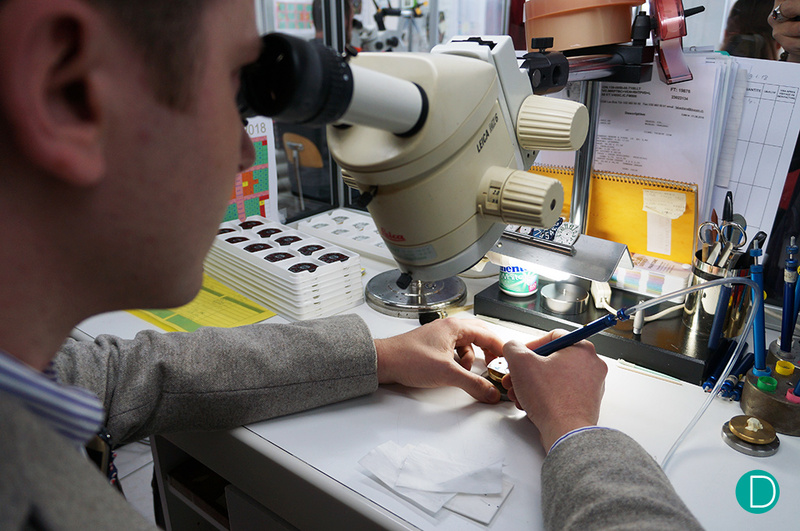 A photo-video essay of the visit tour of the brand's dial manufacturer "Les Fils d'Arnold Linder SA"
We were invited to visit Franck Muller Group’s dial factory, the Arnold Linder SA, in Les Bois, Switzerland and I was nominated for the tour. Couldn’t be happier. This kind of occasion is rare and implies seeing and doing things not accessible to the general public. It’s not a common opportunity even for brand’s intimate collectors. In the last day of SIHH 2018, I head into the heart of Switzerland, to visit the manufacturer. I had the chance to meet lovely people and to deepen my knowledge. This is the factory tour report, with a personal touch. 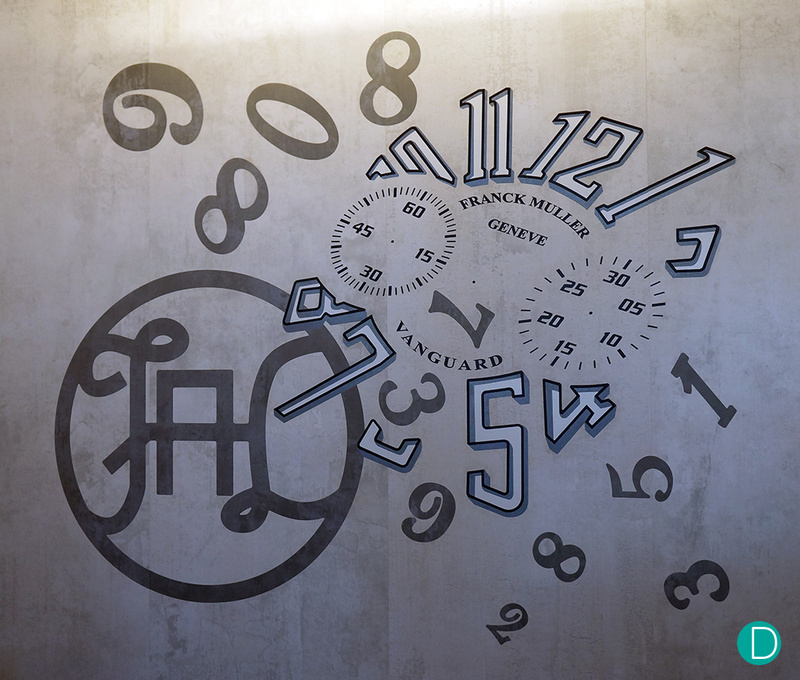 The dial factory entrance awaits the visitors and artisans with a Franck Muller typical decoration – the numerals specific to the brand. 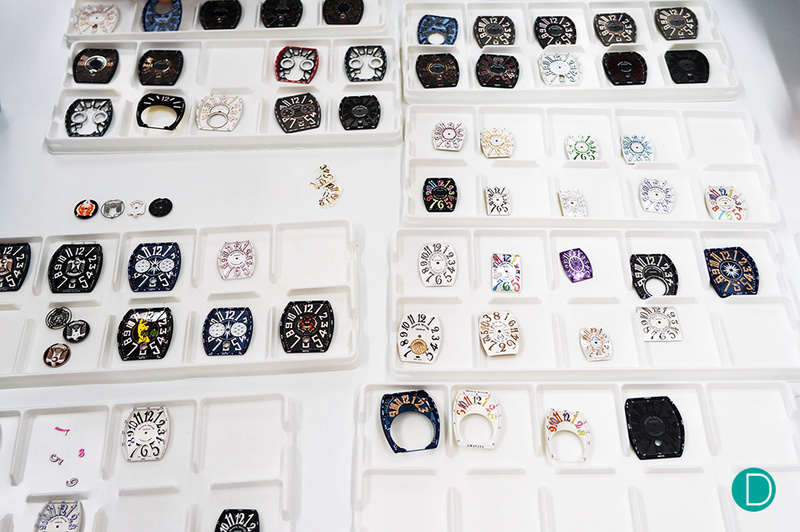 Franck Muller is recognised for its fantastic dials. Starting with the brand’s recognisable crazy Arabic numerals and finishing with the complex decorated pieces, Franck Muller watches feature lovely dials. The tour as organised by Mr Jean-Paul Boillat, the manufacture’s manager. This is the first time the manufacture has opened its doors to journalists. Under this fortuity, over a full day, I discovered how a watch’s “face” is realised. To have an idea, look at the new releases before the SIHH 2018 here or at the Lady Tourbillon Gravity. What made the tour interesting was the format in which it was done. This was not a dry presentation of how a single dial is produced, but an intimate view from the design phase until the final product. 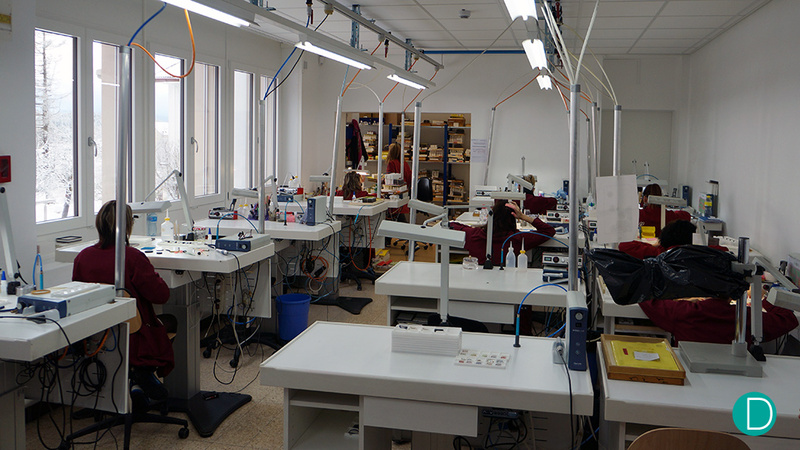 It was more a revealing of the workflows, issues and manufacturing processes that stand behind a dial production. It was a warm introduction, with colleagues and friends, in the mysteries of dial making. Dial “applied decoration” departments – here are hand applied the numerals and other decorating components to the dials. We began at the end. At the final stage of production. Different dials types with different finishes: applied numerals, printed, applied decoration made on the mother of pearl, carbon or brass. The clear intention was to see how a final product look. Having the finished product in mind it was easier to comprehend part of the complexity and the problems of dial manufacturing. Every dial type requires a specific finish with applied numerals or decoration. The numerals are mounted one by one. The components are chosen and fitted. In case the result is not satisfactory, the process is restarted and taken from the beginning. The number appliques are fitted with pins and fixed using rivets, keeping in place on the dial. By the precious numerals fitting, the last number will be “8”, in diamonds, as a lucky charm. In Chinese numerology, the number eight is a lucky number, therefore the diamond setting for this numeral. But the reason why this numeral is fitted last has nothing to do with superstition. Due to the higher value of the diamond set numeral, fitting at the end will decrease the costs in case of quality rejection. All the less expensive decorations are fitted first and, after a quality check, the operator proceeds with the expensive diamond set decorations. The mother of pearl dials requires special attention due to the fragility of the material. MOP dials are spectacular. The artisans avoid coffee and alcohol to keep the hands sure and steady. This work s done at almost the final stage of the manufacturing process. In case of a failure, the piece is tossed, and it is the result of a chain of skilled artisans who worked through it. The pressure mounts the closer it gets to the final product. Mr Jean-Paul Boillat confessed that before the SIHH and the new releases, the work on the new models is hard and requires many extra hours. It’s a boule de neige effect: more work with a new model, more time is required to finish, artisans are more tired and could lead to more failures – just like a snowball slopping down in a fresh snow. 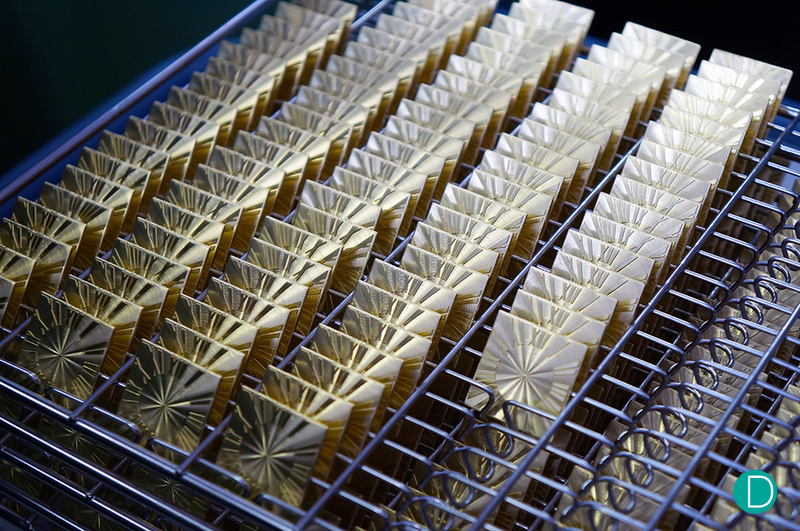 Every detail of the dial is manufactured in the same building, located at the town of Les Bois. 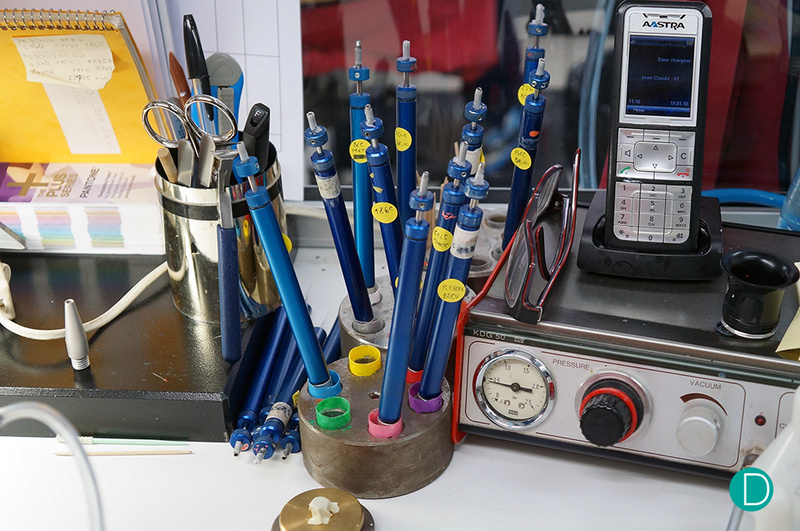 The manufacturer takes a big pride in their capabilities to produce every component in-house, which is not usual within the industry, even among the dial specialists. Each dial is crafted from raw materials, up to the final finish. The number of details and the amount of information in the dial finishing department is overwhelming. For an untrained eye, many of the dial’s elements seemed similar: lacquered, PVD, varnished, plated and so on. But every component has its own production process that can be completely different. 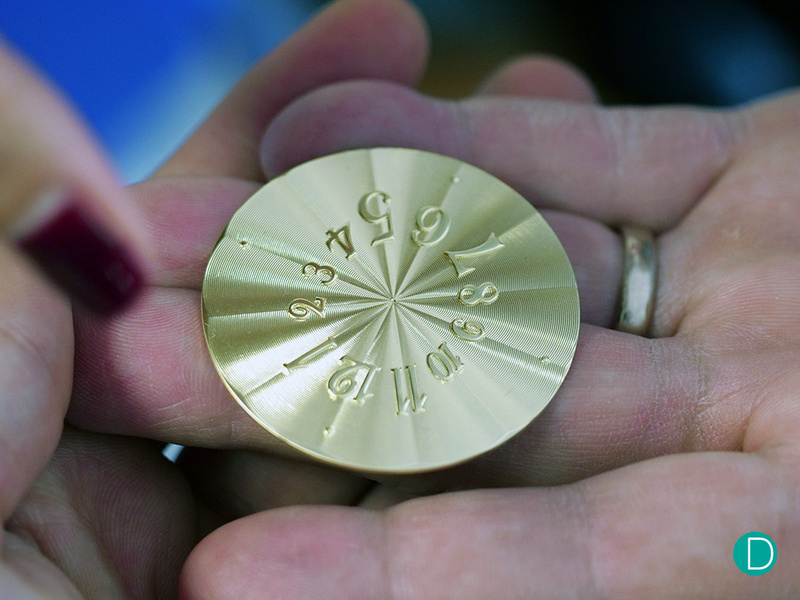 A waved sunray dial ready to go to the next decorating station – numerals lacquer filling. The next room we visited reminds me of the Wild West – perfect silence broken only by shots of pain. It’s the airbrushes system triggered by each operator in the lacquering department. The place where all the applied paint decoration is made. All the artisans sit in an almost fixed position. Only the wrists and fingers move, as they sit in stillness to perform their work. They all wear headphones and listen to their favourite tunes. Almost a must for long days with strong concentration. 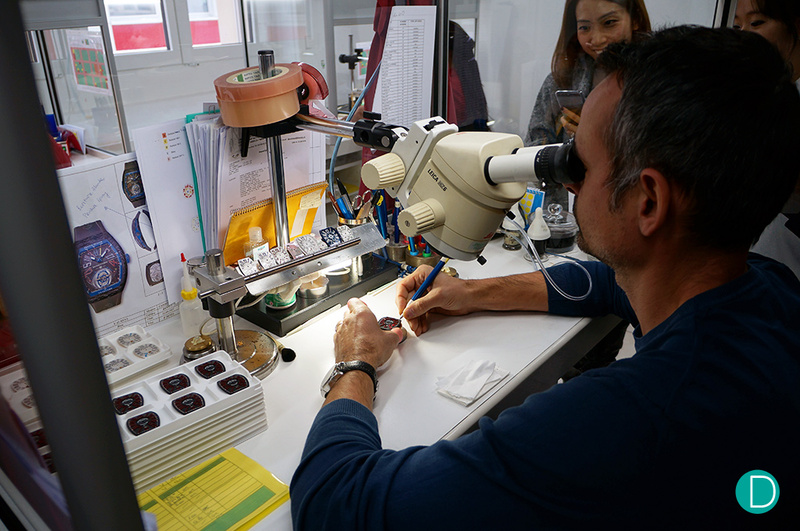 One of the Franck Muller factory’s artisans showing how the work is done – a painstakingly long process. The numerals and decorations are filled with paint from an airbrush. The paint is put on precise spots using a constant airflow source controlled by a foot pedal. The moves are perfectly syncronised: the super steady hand in coordination with the foot controlling the paint flow. The lacquered numerals and decorations on the dial are done using a precise air pressure and “pens” with different colours. For each colour, a separate dispenser pen is used. The expertise to do this is built over years of work. For the example below, Jean-Claude, one of the Franck Muller artisans, has 20 years of experience and exercise. His moves are rigorous, like an ultra-precise machine controlled by invisible wires. But the comparison is wrong because a machine is not able to do his work. Here is another example of painting decoration on a mother of pearl dial: the decorative applied elements are multicoloured in successive steps. Each colour needs one step. That means the pencil must be changed for each colour, waiting in between for the colour to dry. Keep in mind the fragility of the dial mother of pearl dials. This is not a problem during the painting itself, but handling can be dangerous for it. I was also particularly fascinated by the number of details, that usually go unnoticed to the untrained eye. Like the very small decoration realised below. You can hear the sound of the air/paint shots in the background. I was asked if I was willing to try my luck and skills in numerals decorating. A challenge I gladly accepted, afterall its not an everyday opportunity. I had to find the right posture. Working using microscope is not easy, the brain loses a part of the coordination eye-hand due to loss of the reference. Learning how the paint flows, the right stencil motion and the amounts of pedal presses for a certain lacquer amount is not something you master in minutes. At least not me. The author is trying his hand on numerals lacquering. The job requires a perfectly steady hand and a lot of exercises. As expected, my result was way below the necessary quality. But it made me appreciate even more these ladies and gents who are doing this beautiful work for us. Coordination eye-hand-foot must be high for the entire day, every day. The result is not catastrophic, but far, far away from the required quality. In the same room, they fit the diamonds on the elements later applied on the dial. The decorations are mounted on a fixture. The artisan takes a number of diamonds and fits, one by one, on a predetermined position. Since a picture makes a thousand words, a video clip tells an entire story. This kind of work could not be done faster. The paint cannot flow faster and the result depends on the necessary time. A detail not caught in the videoclips or pictures is the exceptional finish of some extra components. While the numerals or decoration filling might appear easy, painting more complex shapes requires an extra degree of dexterity and experience. Moving on backwards, we now get to the beginning. The first steps on how a dial is brought to life. A dial starts in a sheet of brass. A special cutter crop the round disc used later as the base for the dial. 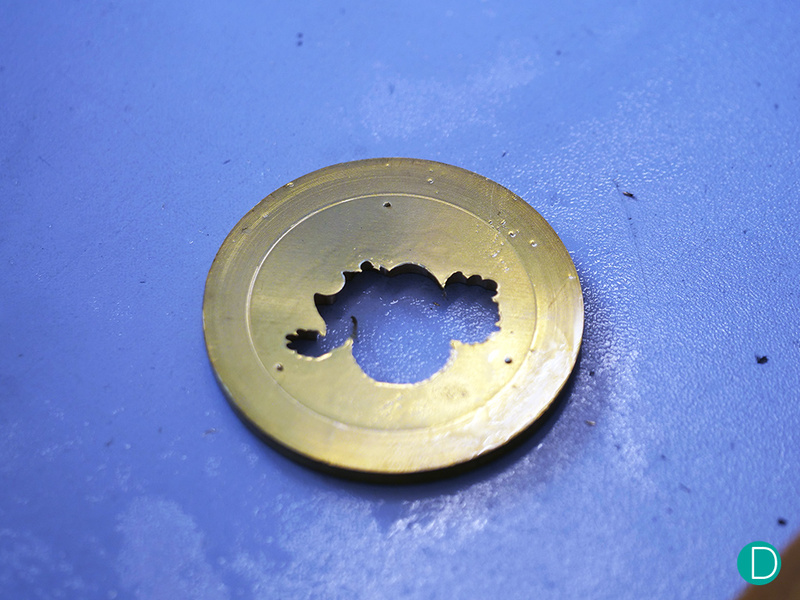 A long and narrow sheet of metal is cut into “coins” that will later become finished dials. The sunray pattern of the dial is realised using a press capable of exerting 200 tons. A dial can be pressed up seven times until the required definition is achieved. The press mould for the waved sunray pattern. Depending on the model, the number of pressings, the pressure and the duration of the pressing time varies. 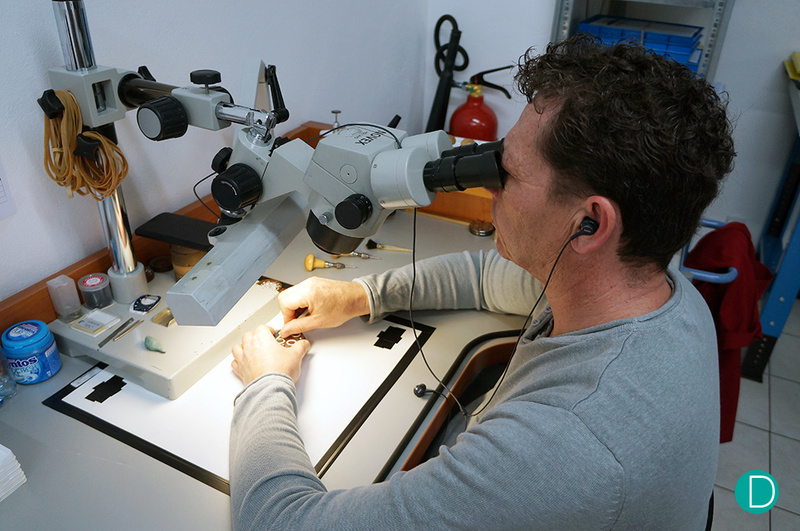 The dial factory has 30 years experience in making dials this way. The press itself is a very interesting device. In the video, the operator might seem to be paying full attention, but only because he has a very exercised routine and knows the machine very well. Not only the waved sunray pattern can be stamped. Some of the dials have also the numerals stamped in this step. 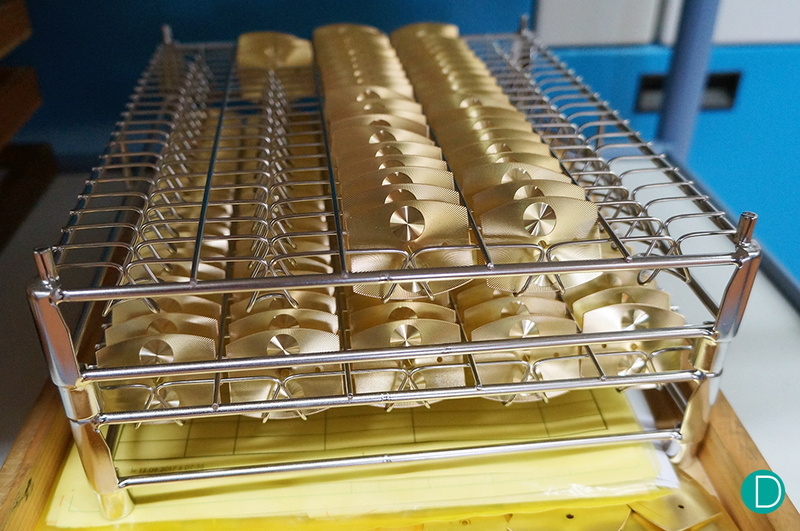 The process is similar, only the pressure and the mould is different. Sunray and numerals after stamping: for the final look, the metal disk is pressed several times using different press-weights and press-duration. The shape and the model vary from one model/collection to another. Bellow another example of a stamped dial. Another type of finish for the stamped dials. The final shape of the dial is obtained using another cutting press machine. This process is done at another side of the manufacturer. 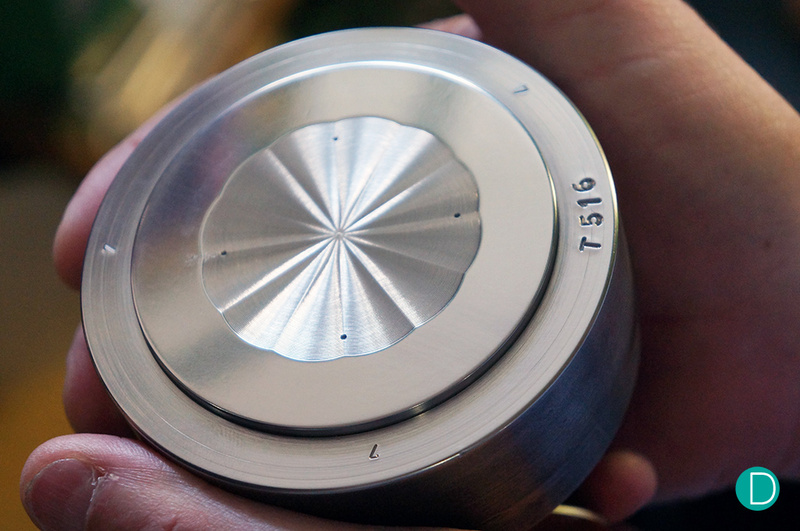 One of the most used processes in modern watchmaking is milling using CNC machines. 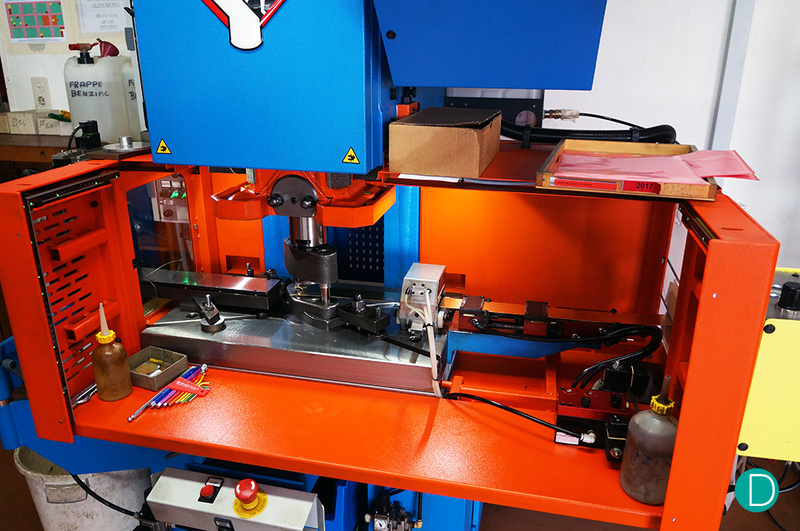 These machines decrease the time needed for some of the repetitive operations required for most of the components. The final finish is, still, done by hand. 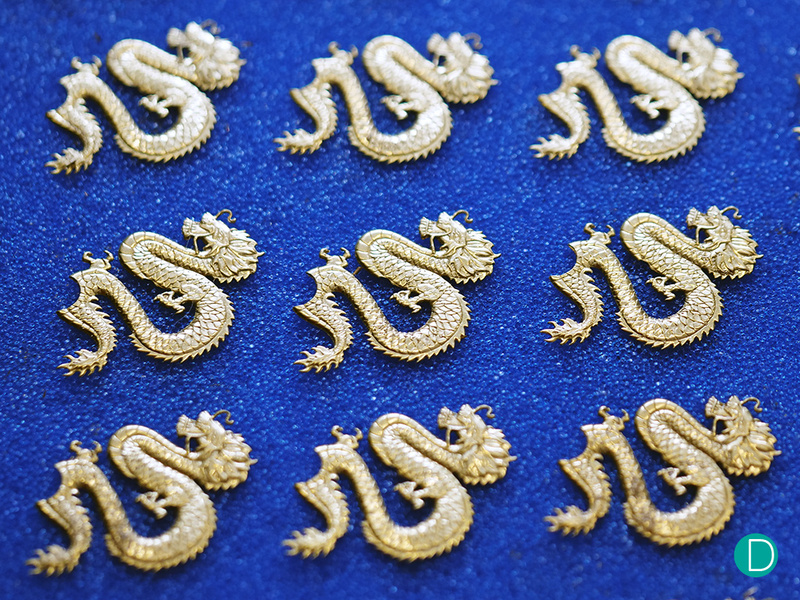 An example of a decorative component made this way is the dragon. 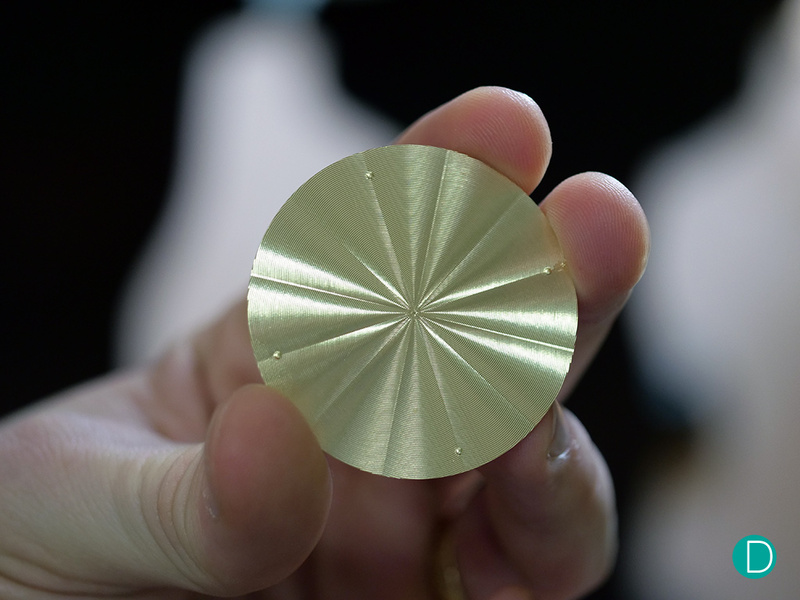 This is a component which is identical on each watch, and a good candidate for CNC milling. And only with the use of these machines can the numbers required be produced in a consistency needed. The dragon is milled inside of a CNC using liquid cooling. The “leftovers” of the dragon – this rest of material is stored for recycling. But the dragon’s journey doesn’t finish yet. It’s cleaned, electroplated in gold and then prepared for dial mounting. 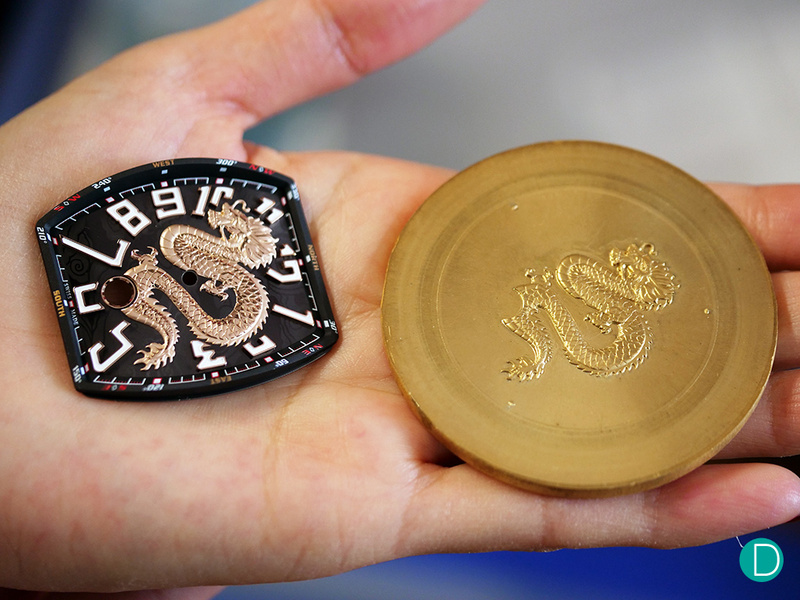 Finished dragons: after milling the dragon out of its base, it is prepared for dial mounting. Other components with a similar manufacturing process are the inner bezel and the mother of pearl dial. Starting from a raw piece of material, the bezel is milled in the CNC machine. 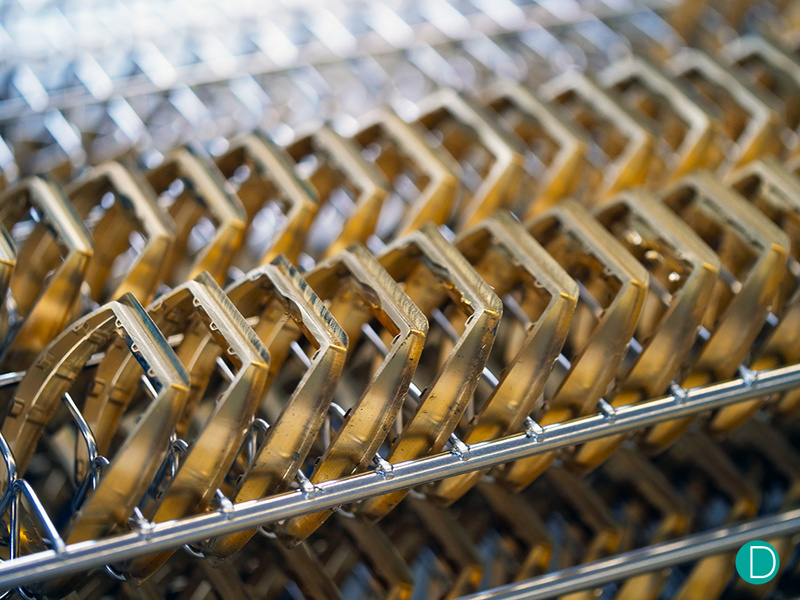 After the mechanical processes are over, the bezel is plated and/or lacquered and decorated. Some bezels require printing to achieve its final look. 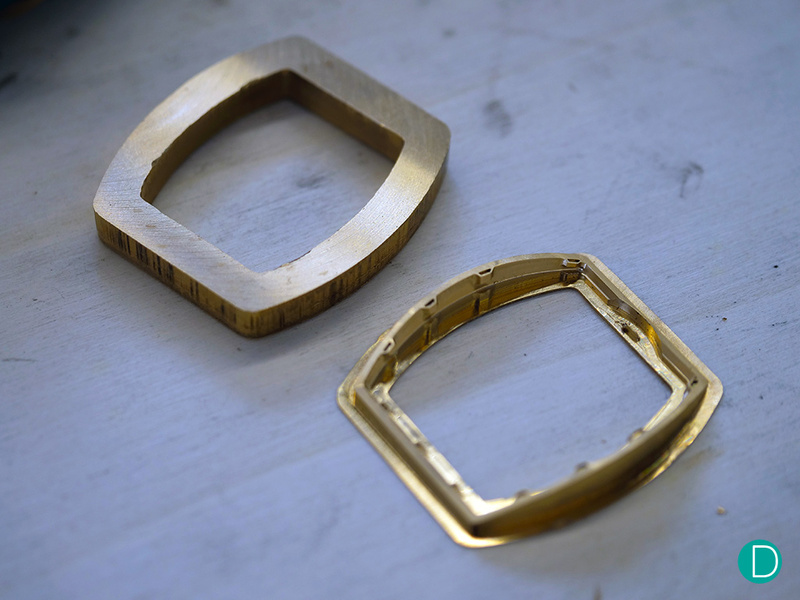 The Bezel starts as a bulky piece of brass and then it is milled using CNC machine. The lower left piece is still in the ongoing state. 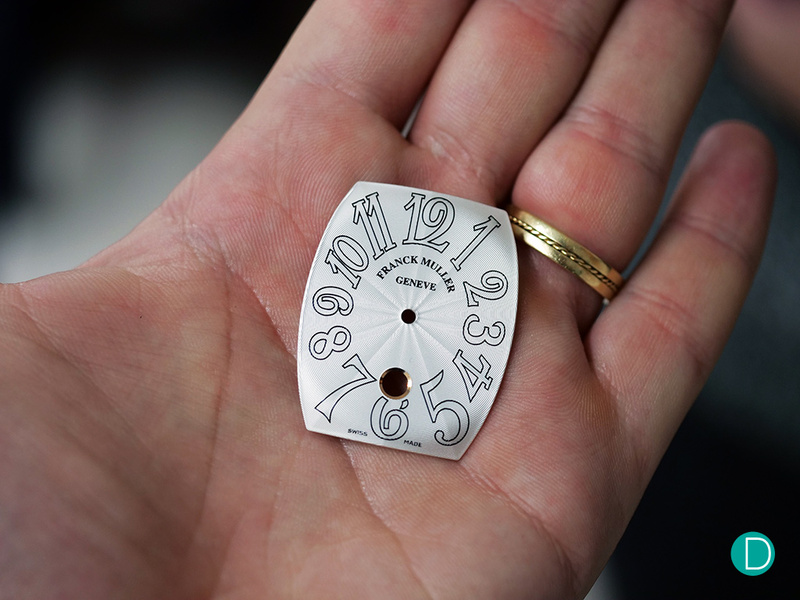 The inner bezel found in several Franck Muller collection is manufactured in several steps, including a computer controlled milling machine seen above. The milling process needs liquid cooling. The universal tool is programmed to pick the right mill head, depending on the angle or operation. For the mother of pearl dials, the process is roughly similar. 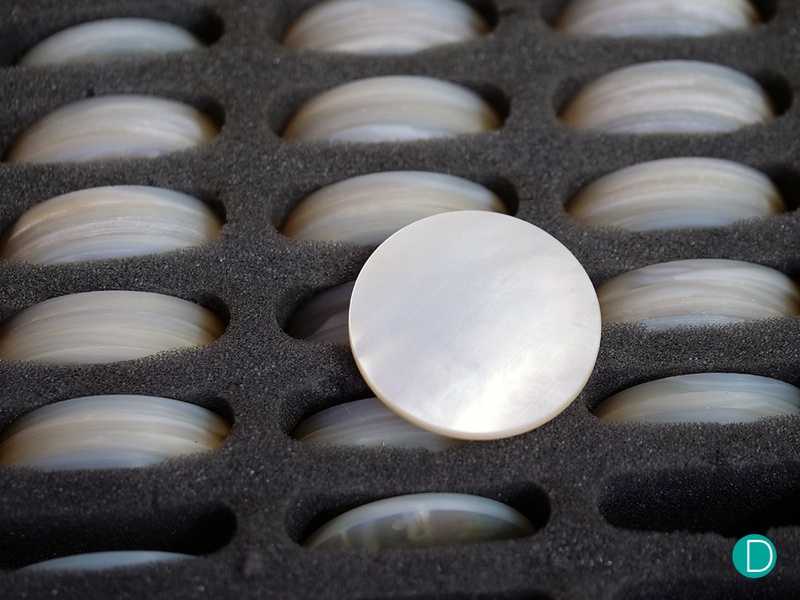 A raw disc of mother of pearl is placed into the machine and then milled. 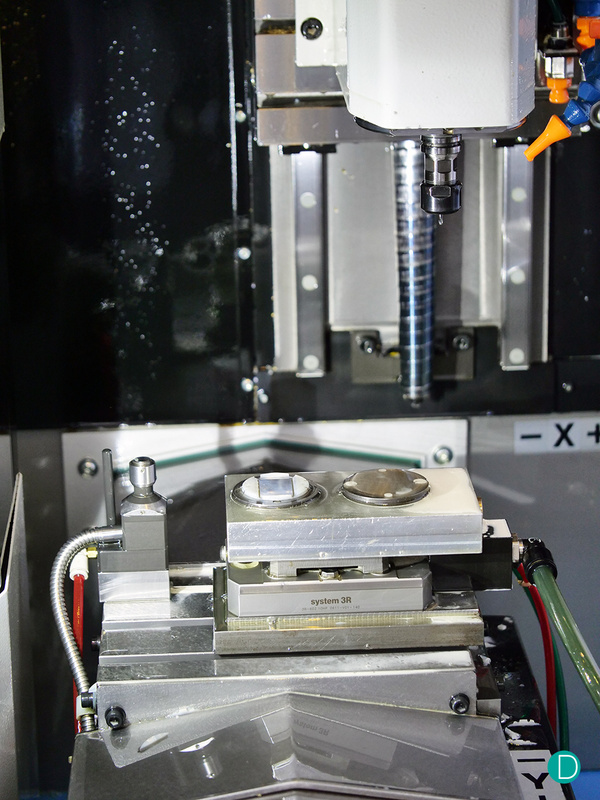 For the precise milling is used a CNC. The mother of pearl dials are very fragile. The processing is done using specialised tools and the mechanical failure rate are higher than those for the metal dial. The dials are manufactured from a solid disk of mother of pearl. 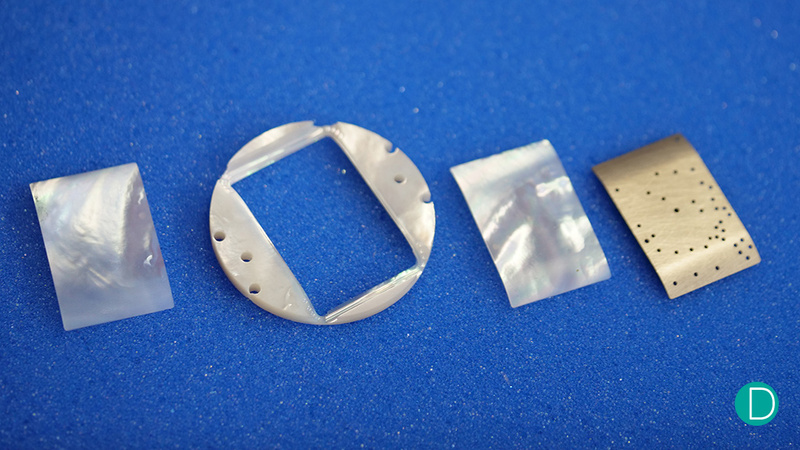 Different steps of manufacturing a mother of pearl dial. 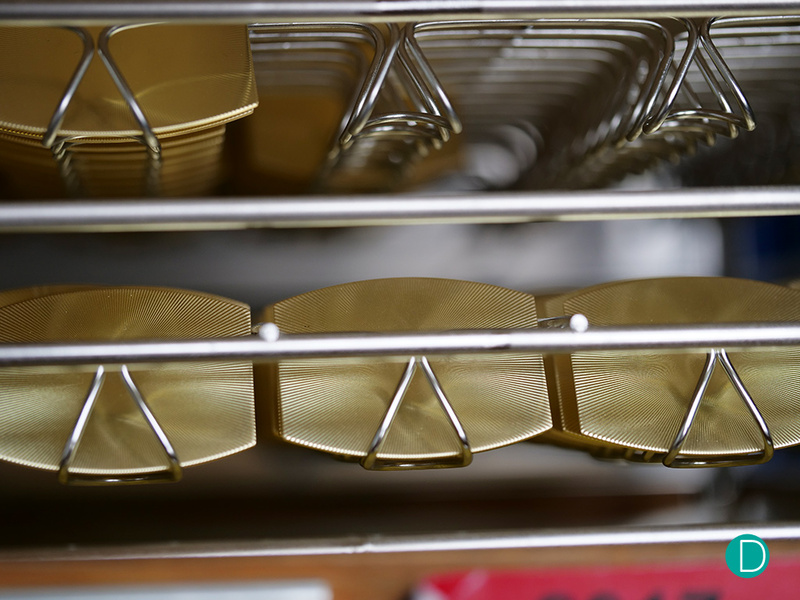 The brass plate is used as a hard base material support for handling between several processes. 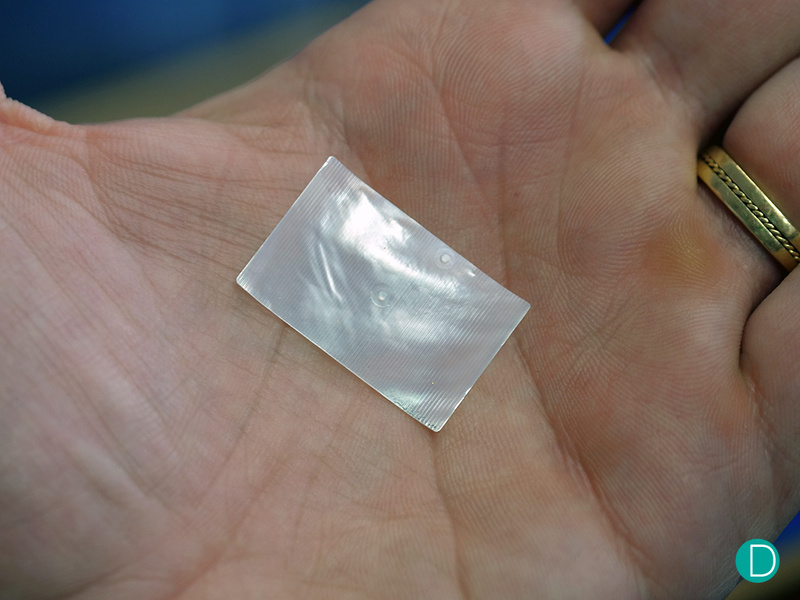 Between manufacturing steps: after milling. 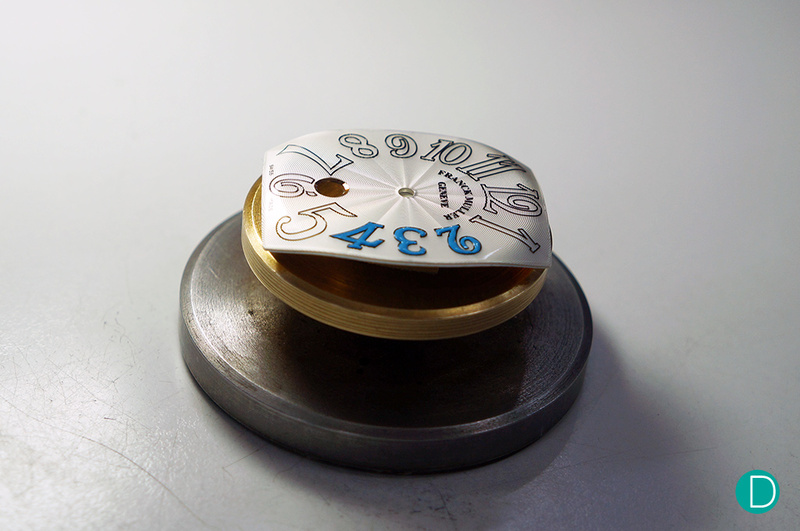 The mother of pearl dials requires the pins to be produced from the start (since it cannot be soldered later on). In this stage, the milling lines are still visible on the dial. Milling can be used also as a process in between different dial stages, as a middle step between finishes and not only as a shape determining step. As an example for the creation of the sub-dials of the chronograph. Please see the pictures below. A stack of sunray brushed dials waiting to become part of a chronograph. But these are only a part of all the processes and operation realised in the facilities from Les Bois of Les Fils d’Arnold Linder SA dial factory. We will continue our article next week on Tuesday, 6th of February.